Certain minerals are capable of absorbing invisible ultraviolet light with a wavelength from 200nm to 400nm and give off visible light with a wavelength from 400 to 700nm and “glow” in the dark, they fluoresce. What makes a mineral glow? Most fluorescent minerals require an activator that initiates fluorescence. The activator is a small amount of a certain chemical element or impurity having been included in the original crystal structure in different places. However, impurities of some elements such as iron and copper deter the fluorescence in minerals. Fluorescent minerals contain certain atoms with electrons that are taken up to a higher excited energy levels by absorbing energy from the incoming ultraviolet light (1). 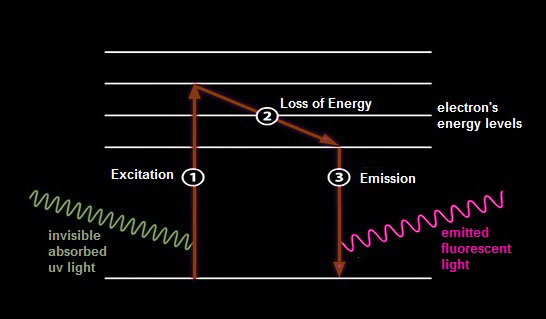 These electrons instantly fall back to their original energy levels, giving off energy in form of visible emitted light (3). This takes place in a very small fraction of a second. We see only the resultant visible light emitted as long as the atoms are exposed to the ultraviolet light. Depending on the energy released when electron returning to their original level (2), minerals exhibit different fluorescence colors.